An Inside Sales Associates work from the office and build a relationship with customers by selling products through phones. 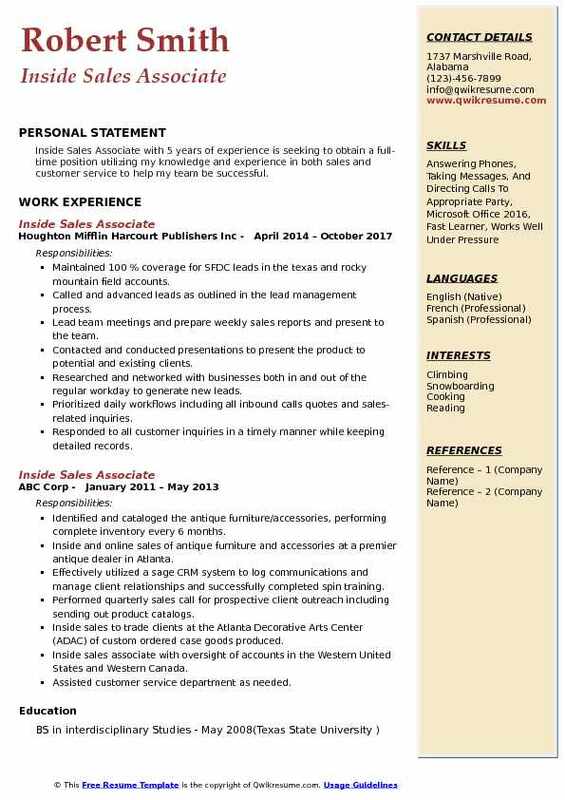 Major duties listed in the Inside Sales Associate Resume include – generating customer list, making calls to the contacts, generating sales, attending programs or training programs, understating the technical aspects, selling the related product/service, establishing customers through phone calls, maintaining records, following up clients, getting feedback, guiding and assisting clients, and reporting to senior team about sales generation. The skills that are considered vital for this post include –strong communication ability, the ability to persuade or convince clients, pleasing and upbeat attitude, basic computer skills, working knowledge of POS transactions, energetic personality and customer focus service. In most cases, candidates get into this job with a high school diploma but in many cases, employers require a further education like a college degree in the related field. 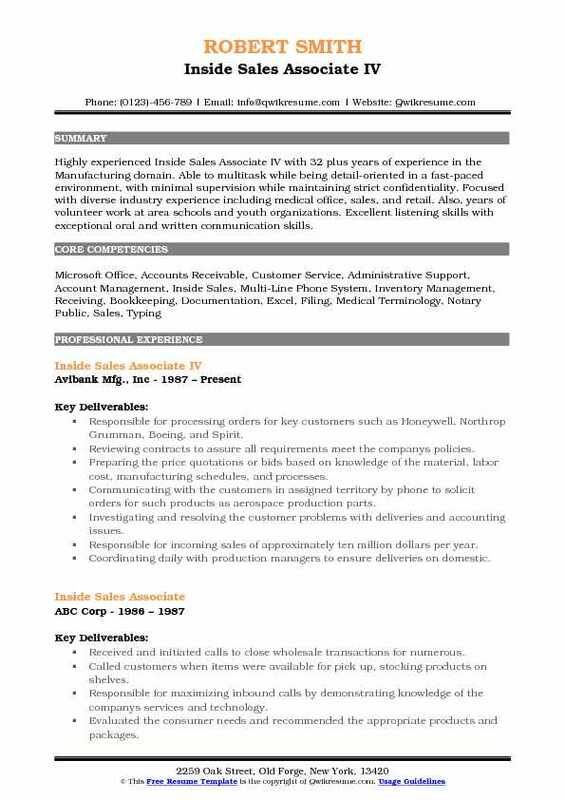 Summary : Professional and efficient Inside Sales Associate IV with 25 years of experience and with extensive marketing and distribution skills. A person who is driven to obtain new customers quickly and effectively and is motivated to generate and increase sales while delivering top-notch customer service. One who meets all deadlines under pressure in fast-paced environments. Proficient with a variety of software applications and excellent communication skills. Responsible for working as a liaison between outside sales representative and key/platinum customer accounts for a multi-billion international company. Promoted within the year from credit/returns to inside sales based on outstanding performance and accomplishments. Assisted in preparing and presenting quotes, presentations and other bid specifications for customers. Maintained and enhanced customer and vendor relations while responding to all customer inquiries in a timely manner. Managed the accounts with sales volume in the millions with a 99.8% accuracy rate. Created strategies to grow customer base which resulted in a 10-20% increase in monthly sales. Successfully managed a high-volume workload within a deadline driven environment. Assisted purchasing with stock orders, including specials, direct orders, and inventory strategy while managing a large amount of customer-specific inventory. Handled special making orders on the sheetfed and web business while working closely with converters. Instrumental in implementing the company computer software upgrade system. Summary : Inside Sales Associate II with over 15 years of experience exceeding quotas, increasing account profitability, territory management, and continued education. Analyzed client specific data to customize financial products for asset acquisition. Developed new business plans/processes to customize services of existing customers. Designed and implemented company specific accounting and asset management software. Designed and maintained all internal process flows and training materials. Primary trainer for all internal training and continuing education programs. Facilitated cooperation with multiple departments (accounting, credit/collections, insurance, title/registration) to improve customer negotiated processes. Managed national sales territory, training, and supervision of four outside sales associates. Created and established new business division financing/leasing heavy equipment resulting in an annual increase of over $700,000 in profit. Negotiated pricing structures with clients, outside vendors, Altec Inc subsidiary companies. Summary : Inside Sales Associate III with 18 plus years of experience in the Retail domain is seeking to secure a position with a well-established organization with a stable environment that will lead to a lasting relationship. Skills : Microsoft Office, Word, Excel, E-Mail, M3/Movex, Copy Machines, Scanners, Powerpoint, Fax Machines, HQMS. Inside sales, write orders and quotes for products, services, and parts, write the bill of ladings, inventory, receive products, and track shipments. Providing excellent customer service and developing strong relationships with customers. Processing a high volume of invoices daily for accounts payables in Wesco Hampton, Norfolk, Roanoke, and Lynchburg VA. Responsible for identification and qualification of sales opportunities including lead handling and technical pre and post sales activities to increase sales revenue. Filing important paperwork daily, boxing up files yearly, and sending them off for record retention. Daily credit card report of sales made daily for accounts receivables. Weekly checking the report for sales made paid by check for accounts receivables. Daily multi-tasking to fulfill assignments for the district and administrative managers in Hampton, Norfolk, Roanoke, and Lynchburg VA. 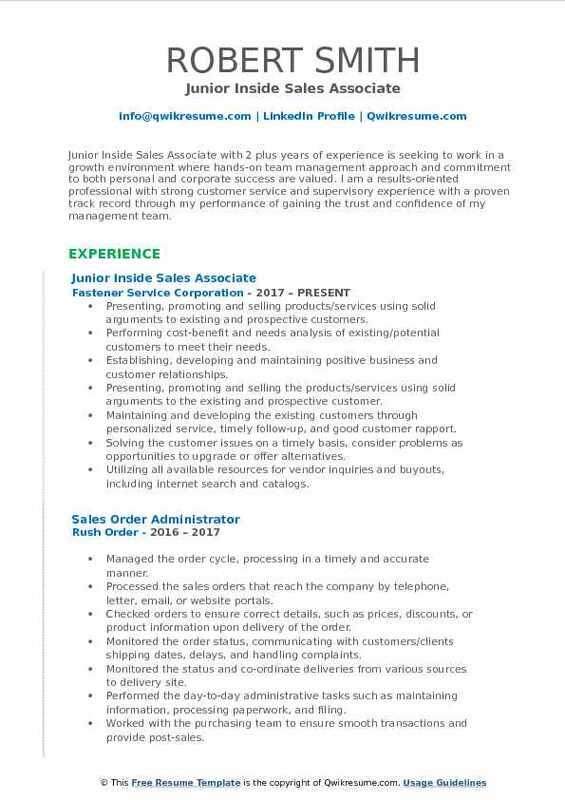 Objective : Junior Inside Sales Associate with 2 plus years of experience is seeking to work in a growth environment where hands-on team management approach and commitment to both personal and corporate success are valued. I am a results-oriented professional with strong customer service and supervisory experience with a proven track record through my performance of gaining the trust and confidence of my management team. Presenting, promoting and selling products/services using solid arguments to existing and prospective customers. Performing cost-benefit and needs analysis of existing/potential customers to meet their needs. Establishing, developing and maintaining positive business and customer relationships. Presenting, promoting and selling the products/services using solid arguments to the existing and prospective customer. Maintaining and developing the existing customers through personalized service, timely follow-up, and good customer rapport. Solving the customer issues on a timely basis, consider problems as opportunities to upgrade or offer alternatives. Utilizing all available resources for vendor inquiries and buyouts, including internet search and catalogs. Maintaining the awareness of vendor an customer open orders, material flow, and product processing. Summary : Sr. Inside Sales Associate with 11 years of experience in the Food domain is seeking a position that allows me to use my customer service and organizational skills in order placement, fulfillment or administrative duties. Introduced these products by phone calls (40-70 per day), LinkedIn, email and mailing letters to purchasing and Presidents' of companies. Followed up with these potential clients a few days after the 1st communication. Made sure to answer all incoming calls as well. Entered and processed all expense reports through QuickBooks, then printed and mailed those checks every friday afternoon and updated all excel spreadsheets for the owner of the company. Worked with a team of seven colleagues on site as well as an additional three based out of our new jersey home office. Aided in running as well as personally oversaw the facilitation of meetings. Prioritized the establishment of rapport, relationships, and reliability with all of my customers. Provided high-level administrative support to national account managers assisting with customer accounts, vendor relations, and pricing registration programs. 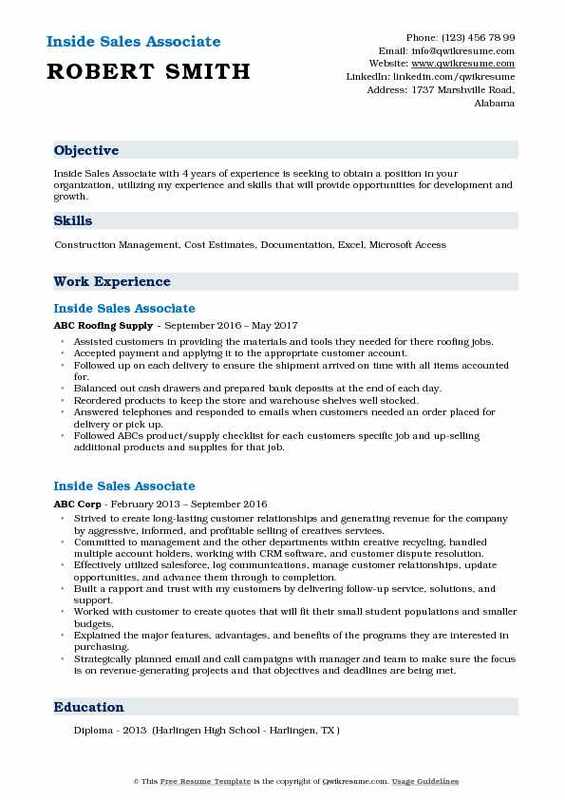 Objective : Inside Sales Associate with 4 years of experience is seeking to obtain a position in your organization, utilizing my experience and skills that will provide opportunities for development and growth. Assisted customers in providing the materials and tools they needed for there roofing jobs. Accepted payment and applying it to the appropriate customer account. Followed up on each delivery to ensure the shipment arrived on time with all items accounted for. Balanced out cash drawers and prepared bank deposits at the end of each day. Reordered products to keep the store and warehouse shelves well stocked. Answered telephones and responded to emails when customers needed an order placed for delivery or pick up. Followed ABCs product/supply checklist for each customer's specific job and up-selling additional products and supplies for that job. Determined customers needs and recommending appropriate products and solutions. Provided excellent customer service to all customers with a positive attitude and a friendly smile to assure our customers were satisfied with our services. 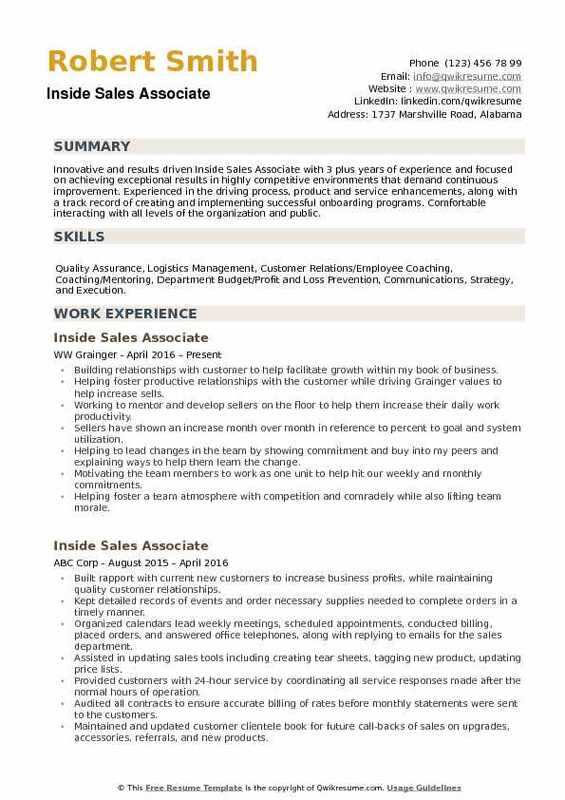 Summary : Focused, dedicated, and highly motivated Inside Sales Associate with 12 plus years of experience and with a proven track record of success in sales across multiple lines of business. Skilled in building collaborative relationships with new and existing customers and executing strategies that generate quantifiable results. Proven experience in creating synergistic relationships with coworkers and supplier partners. Responsible for sales to current customers and establish new customers which stretch across several industries. 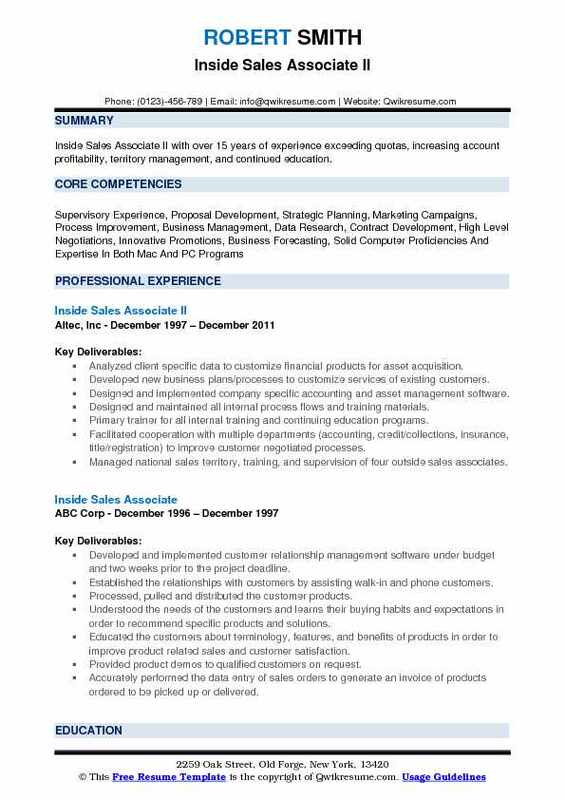 Only inside sales associate to exceed $1,000,000 in sales for the fiscal year. Delivering superior sales presentations to customers by establishing specific objectives, maintain customer interest and providing product recommendations according to client needs. Ensuring prompt response to client inquires, quotes, calls and complaints via telecommunication, email, and client visits. Learning and utilizing several manufacturers specific quotation applications to complete sell of material handling equipment. Developing sales leads generated by company website and ensures timely follow up. Establishing and maintaining new and existing contracts with several different companies. Assisting in training new and current personnel on internal applications, policies, procedures, and process. Self-initiating prospecting via searching through sales history database for inactive customers to cold call. 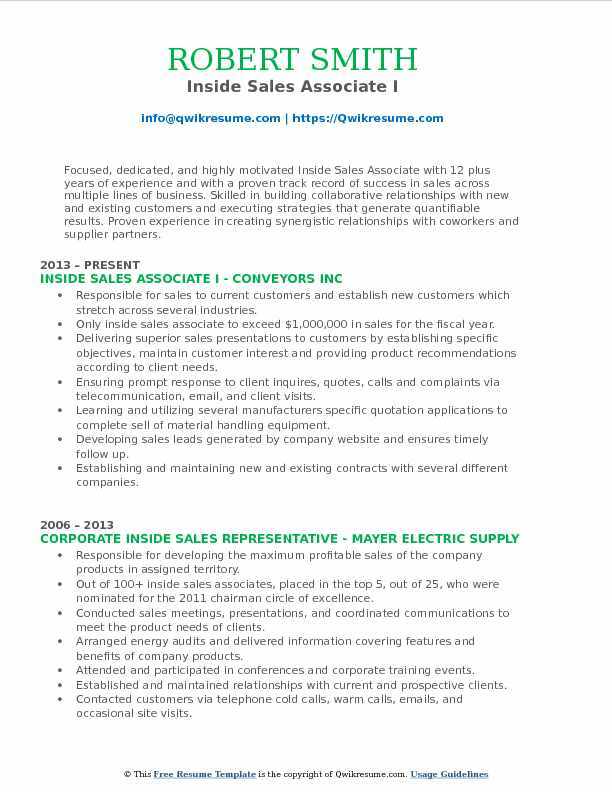 Summary : Highly experienced Inside Sales Associate IV with 32 plus years of experience in the Manufacturing domain. Able to multitask while being detail-oriented in a fast-paced environment, with minimal supervision while maintaining strict confidentiality. 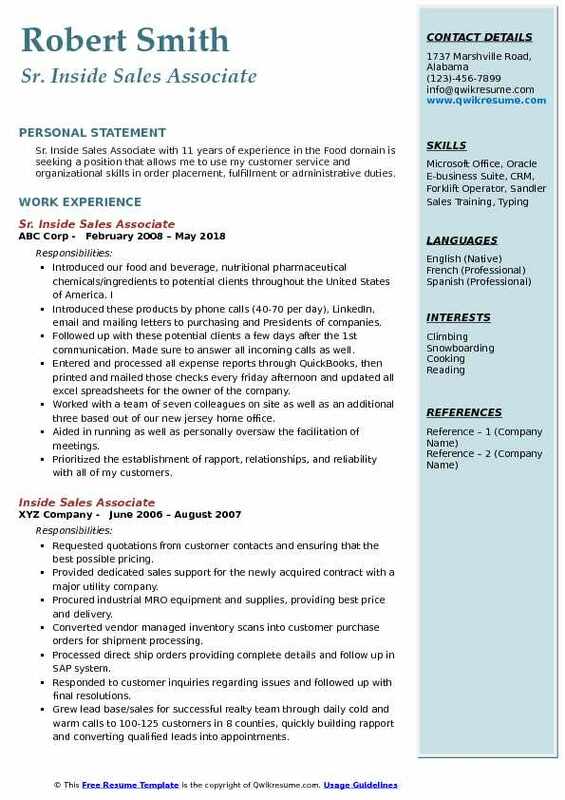 Focused with diverse industry experience including medical office, sales, and retail. Also, years of volunteer work at area schools and youth organizations. Excellent listening skills with exceptional oral and written communication skills. Responsible for processing orders for key customers such as Honeywell, Northrop Grumman, Boeing, and Spirit. Reviewing contracts to assure all requirements meet the company's policies. Preparing the price quotations or bids based on knowledge of the material, labor cost, manufacturing schedules, and processes. Communicating with the customers in assigned territory by phone to solicit orders for such products as aerospace production parts. Investigating and resolving the customer problems with deliveries and accounting issues. Responsible for incoming sales of approximately ten million dollars per year. Coordinating daily with production managers to ensure deliveries on domestic. Assisting the walk-in clients from greeting to merchandise pickup. Building relationships with key decision makers and matching the customers with the right solutions for their needs. Consistently made the top 13 list on outbound calls and sales on the corporate daily results. 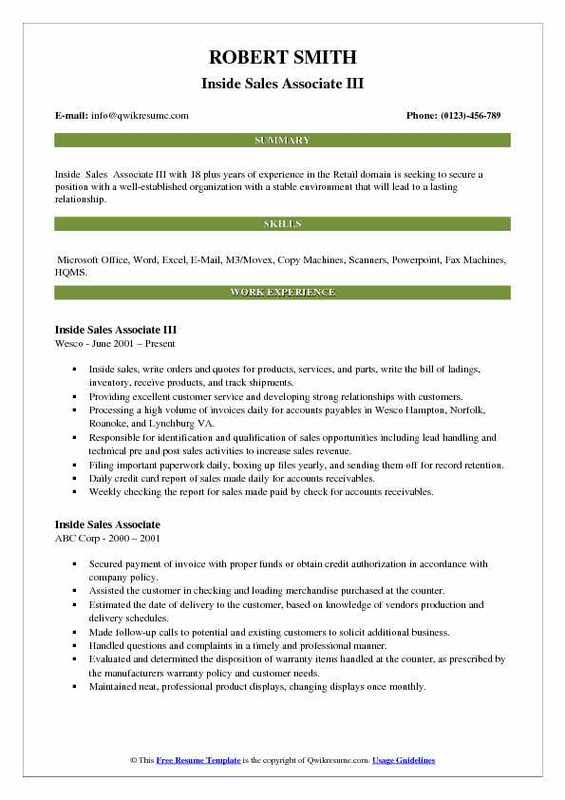 Headline : Inside Sales Associate with 5 years of experience is seeking to obtain a full-time position utilizing my knowledge and experience in both sales and customer service to help my team be successful. Maintained 100 % coverage for SFDC leads in the texas and rocky mountain field accounts. Called and advanced leads as outlined in the lead management process. Lead team meetings and prepare weekly sales reports and present to the team. Contacted and conducted presentations to present the product to potential and existing clients. Researched and networked with businesses both in and out of the regular workday to generate new leads. Prioritized daily workflows including all inbound calls quotes and sales-related inquiries. Responded to all customer inquiries in a timely manner while keeping detailed records. Liaisoned between inside and outside road reps and the showroom. Consistent client follow-up on a daily and weekly basis regarding existing orders and sales quotes. 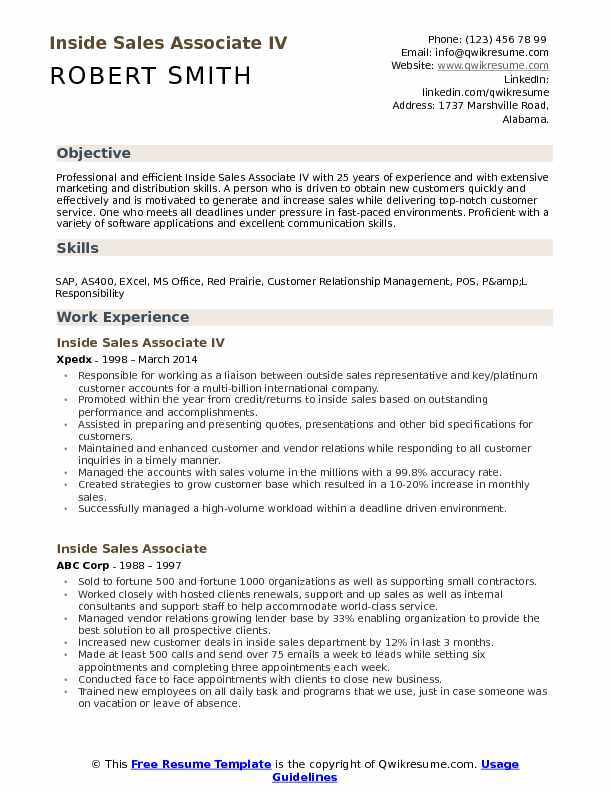 Objective : Innovative and results driven Inside Sales Associate with 3 plus years of experience and focused on achieving exceptional results in highly competitive environments that demand continuous improvement. Experienced in the driving process, product and service enhancements, along with a track record of creating and implementing successful onboarding programs. Comfortable interacting with all levels of the organization and public. Skills : Quality Assurance, Logistics Management, Customer Relations/Employee Coaching, Coaching/Mentoring, Department Budget/Profit and Loss Prevention, Communications, Strategy, and Execution. Building relationships with customer to help facilitate growth within my book of business. Helping foster productive relationships with the customer while driving Grainger values to help increase sells. Working to mentor and develop sellers on the floor to help them increase their daily work productivity. Sellers have shown an increase month over month in reference to percent to goal and system utilization. Helping to lead changes in the team by showing commitment and buy into my peers and explaining ways to help them learn the change. Motivating the team members to work as one unit to help hit our weekly and monthly commitments. Helping foster a team atmosphere with competition and comradely while also lifting team morale. Helping team members learn ways to navigate through support departments to get desired outcomes. Acquired information needed to order parts and worked with other departments to gather part information that varied from one coach to the other.